Hi Everyone! Arlo Here! Yesterday was my 3rd Birthday! Mom put something special up there, I can smell it! I put on my party hat so that I could celebrate in style! It was a Filet Minon Dinner! I got to eat it at the table! I also got some other cool stuff. I got a rope bone (my favorite! ), I got a rope ball, a reflective harness, and a special birthday dinner! Here I am with My rope ball. 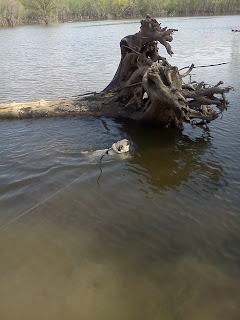 And Here I am with my rope bone. I had a great birthday and I'm so glad I got to share it with you! I can't wait until next year! Hi Everyone! Arlo here with a public safety announcement. I know that furminators seem like the perfect solution for a dog that is awesome in every way, but sheds like a snowstorm. They can be, but I'm here to warn you they can be dangerous! Last Sunday, my mom had decided that she had had enough of the springtime shed so she decided to bust out the furminator. She was brushing, and the hair was coming out, so she kept on brushing and brushing and it was working fine until she noticed that my neck was really red. She gasped in horror, immediately scooped me up and gave me a cool bath. When I was dry she put some cornstarch on me and the next morning everything looked ok. Little did she know. She noticed that I've been a little itchy this week, thinking since it's springtime and the grasses are flying, she gave me another bath and found the real reason I've been itchy. 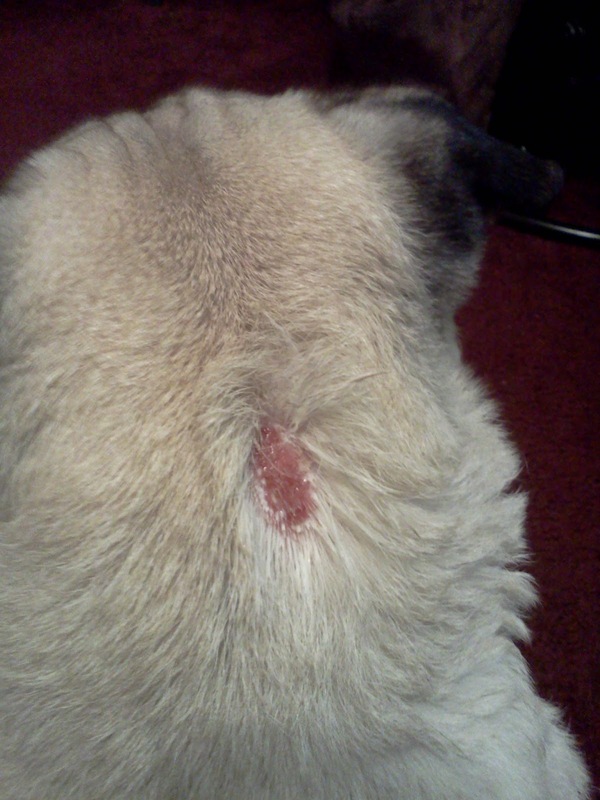 The stupid furminator gave me a hot spot! She feels horrible! (Which means I get extra guilt cookies and loving.) I told her it was ok, I still love her. She promised me that she would never let it happen again, but we don't want the same thing to happen to other puggies. 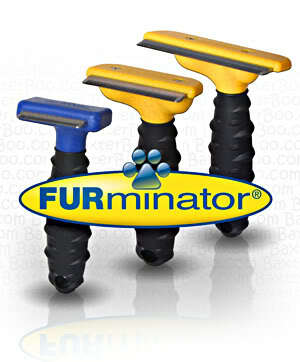 Be careful with your furminators! Love, Arlo. Yesterday, we went on an adventure! We started out heading to the Azalea festival in Muskogee, but there just weren't that many flowers blooming and the sun was shining and the weather was beautiful, so after we took this picture, we got back in the car and headed to the Lake! I am a water Dog! I love to swim! 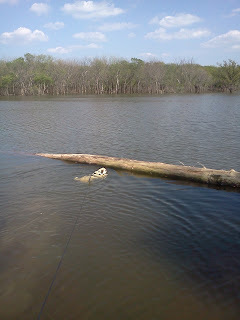 I was hot so I went swimming and tried to stand on this log, but it was too tall. I don't know where this log came from, but it sure was big. After all that swimming and car riding, I sure was tuckered out. I slept the whole way home. Well, That was my adventure! I hope to have a lot more adventures coming up soon to share with you guys. Until Next time! Love, Arlo. Hi friends! It's the Chinese new year! The year of the dragon! So I decided that I wasn't too late in keeping my resolutions, I am just going by the Chinese calendar. Yeah, that's it...well, that and I can never get my mom to let me use the computer! She is always on facebook! I hope that you guys are having a great new year so far. I know I am! I'm getting a new cousin! not the four legged, furry kind, but the human kind! My mom is all excited because she is going to be an aunt! Well, that all the news that's fit to print for now! Love, Arlo. I hope everyone had a very merry Christmas and/or a Happy Hanukkah! Did Santa Paws Come to your house this year? He came to my house! He brought me this big cozy bed. and he bought me this new fancy collar. He also brought me a new rope bone! The end of Christmas means that the New Year is just around the corner! Our New Year's resolution is to be better bloggers! We have missed all of you guys while we've been gone and we hope to catch up soon!! Hi Friends! 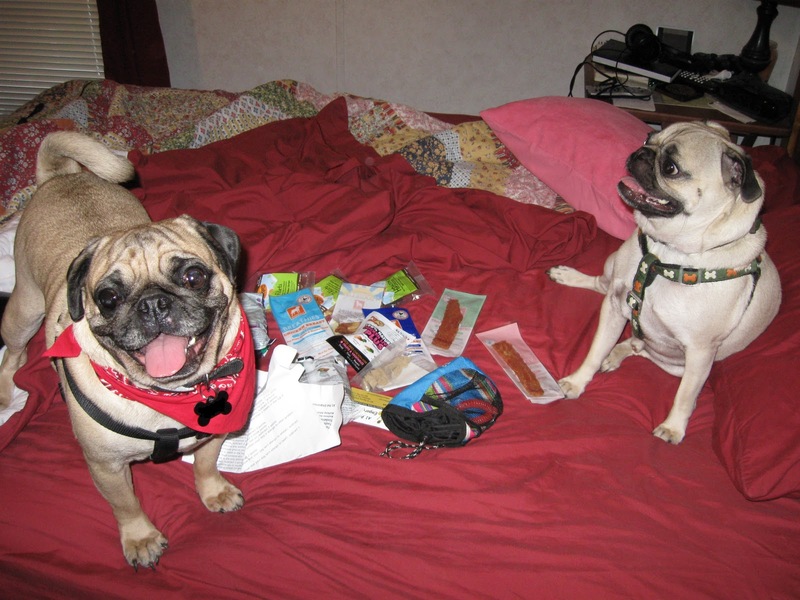 Here a couple of weeks ago, my cousin Luke and I took off for Oklahoma City to go to a place called Puggerfest. 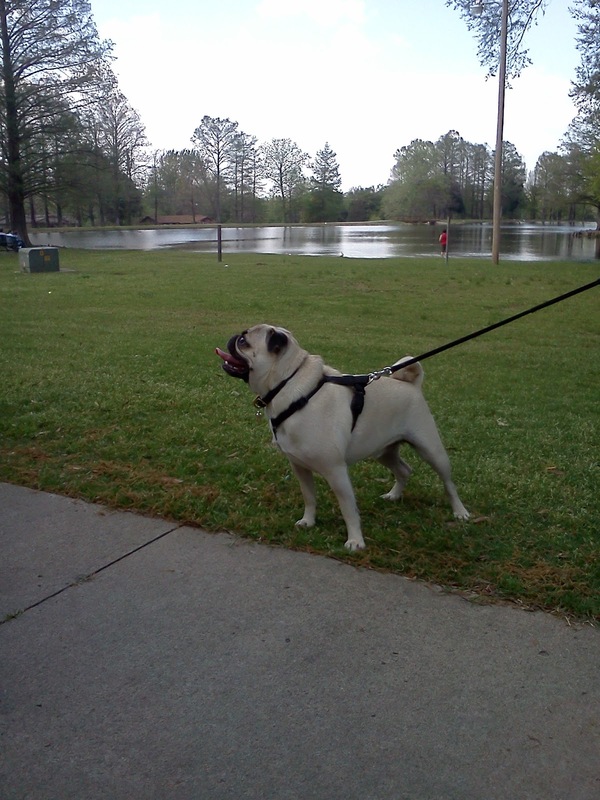 There were a lot of pugs and their people there. Here I am! I'm taking a break from all the sniffing. Here's My cousin, Luke! He likes to pose for the camera. There were so many pugs there and a lot of them were dressed up. We thought the tye-dyed pug here was pretty cool. Me and Luke cleaned up with some serious swag. I hope we get to go next year! 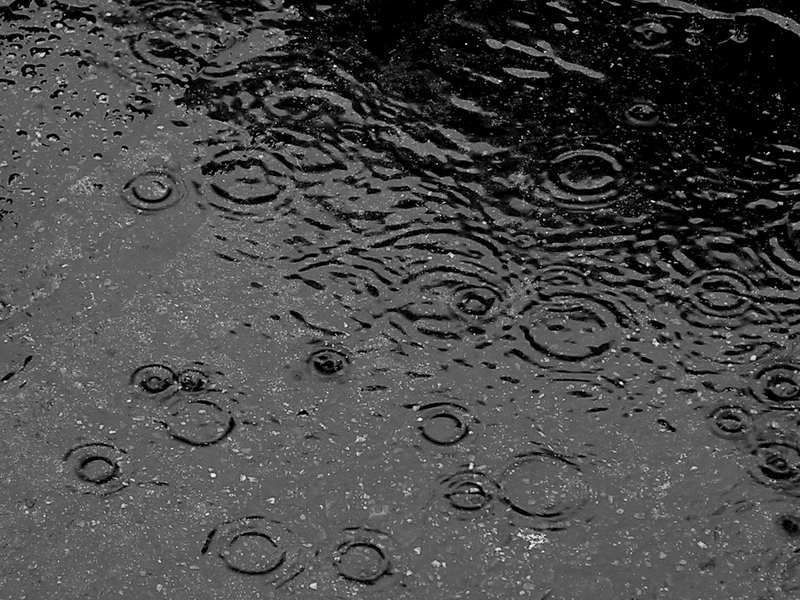 The tears are like raindrops. My mom's eyes have been leaking a lot lately. I asked her why and she said that she misses our friends. 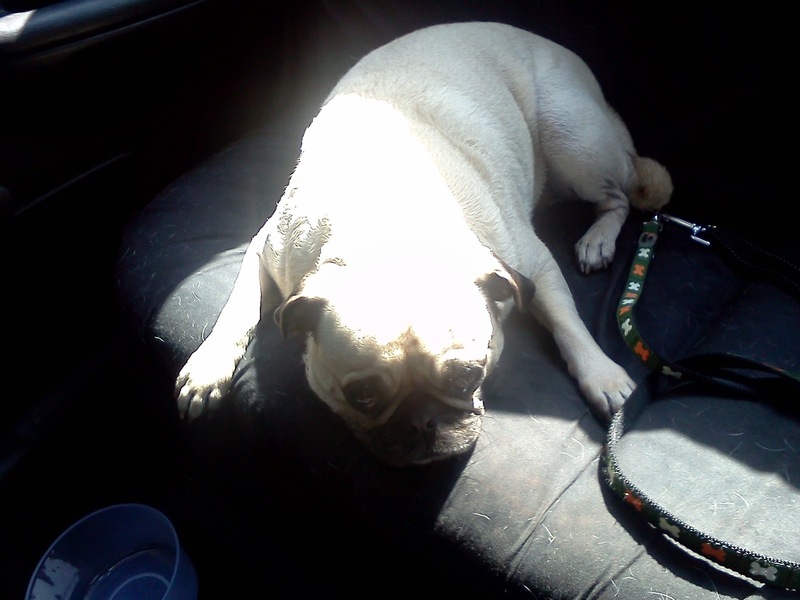 Stubby and Emmitt, Josie, Molly and Lilo have all gone across the Rainbow Bridge. We will miss them all very much, but we have to keep hope that we will see them again someday and take comfort in the fact that they were welcomed across by the ones that have gone on before and that now they are young puppies again, running around, chasing each other without a care in the world. You were our friends and you will be missed. Love, Arlo and Arlo's Mama. We did! We mostly just stayed home and relaxed, but our local dogpark just opened up after being closed for over a year, so we went there on Friday. "What? We're going to the Dogpark!?!" Saturday and Sunday and even on Monday, we just slept in and hung out and had lots fun. I mostly played with my rope toy until this evil slipper tried to steal it. Luckily it didn't, but in case it did, I have like 3 back-up rope toys stashed away somewhere. Well, hope everyone out there in bloggy land had a great weekend, too! Love, Arlo. Hi Everypuggy!! I missed you all so so so much! I've been thinking about all of you while I've been away. Not much happened while we were away, but just recently TWO very big things happened! One: I turned TWO years old (very appropriate don't you think?) and Two: My mom graduated from college! Yay! Here I am in my birthday hat! I'm ready for my birthday dinner! My mom got me a hot dog for dinner! Then, I got my presents! I got a wonky bone and a rope toy! Yay!! Congrats mom! Now you can play with me instead of reading those silly book things. Well, we are so glad to be back and we are looking forward to cathing up with all of you!! Love, Arlo. I hope all my puggy friends and people friends had a very very Merry Christmas! Santa paws brought me a present too! We hope that everyone has a fun and safe new year, too. Goodbye 2010, Hello 2011! If you're not a fan just stop right here. Potter mania! My mom totally has it bad. She's read all the books more than a few times each, she has all the ﻿movies. She has all the stuff, she even dressed me up in some Gryffindor garb (see above). What is all the fuss about? Apparently this is the beginning of the end or something. She was telling me that she has a theory. Apparently in the world of Harry Potter, there are magical creatures that are disguised as everyday normal animals. She thinks that pugs are a great example of these aforementioned magical creatures. 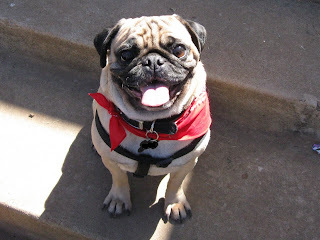 Proof positive: have you ever met a pug that didn't make you smile, or make you happy when you're down? Exactly. 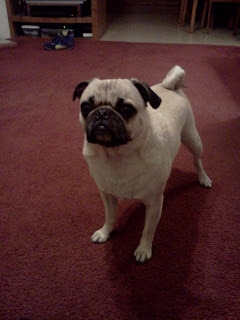 Pugs are really magcal creatures that affect the mood of everyone they come in contact with. What books do you guys read? We love books, particularly books about pugs, but really any books. My mom likes to read a whole lot and she would really really like it if you guys would recomend some great books to her (and by proxy, ME!) I'm not really sure when she thinks she's gonna have time to read said recommended books seeing as how she CAN"T EVEN FIND THE TIME TO BLOG ANYMORE! Bark Bark Bark! But anyways, I still love her. And I still love all of you guys too. Sorry that we haven't been on here much. We really really do plan to rectify that as soon as this really crazy semester is over. We love you all and we miss you all! We would like to send out our love to Tweedles, S-Dog, Pearl, Tuni, Sequoia, Daisy, Lilo, Harry, Lulu, Josie, Izzy, Katy, Anakin, Winston, Stubby, Emmitt, Jemima, Hank, Molly, Gen and the Foo, Wilma, Coco, Kitty+Coco, Paco, Yoda, Brutus, DW (an honorary pug), Oakly and Swisher, Our new friends Lola, and the teachers pets and anyone else we forgot...We love you and thak you for being our friends!!! Pee-S, don't forget to recommend those books!! Let me tell you about my cone of shame. Well, it all started about a month ago. I had this weird growth on my dewclaw. It started out as a weird round node type thing about the size of a pencil eraser. Mom freaked out and googled some stuff and decided that it was best just to wait it out and see if it went away. Well, two weeks later it was bigger. So she scheduled me an appointment for the vet. He said it was a cyst, that it wasn't...well...the c-word or anything and that I'd be fine, but mom was still really worried. Ok, we get home and two weeks later it's getting a lot bigger and I am constantly chewing on it, and it's bleeding everwhere, and mom is still freaked out about the c-word, so we decided that it would be best if it was removed. This picture was taken the day before it was removed. Pretty big and nasty, huh? This is what my dewclaw is supposed to look like. THe vet said he could remove it, but he would have to take my dewclaw too, and that mom might as well go ahead and have them both removed at the same time. That's why I have 2 peglegs. Mom took those bandages off the next night, but I can't keep from licking. You know how us dogs are. The vet said that if I licked it, Mom could re-wrap it and mom tried that, but I really really hate those sock things, so mom decided to try something else. We had this old cone thing from when I had...uhhh...ummm, that certain male dog surgery, you know... and i like it soo much better than those sock things. We need the power of the paws. Hi Guys, Arlo Here. Sorry it's been so long since I posted anything new, but really, nothing has been happening around here. My mom started back to school and for some reason has been super busy reading and studying. One thing that did happen is that we need the power of the paws for my aunt Janie. She is Cousin Amos and Cousin Luke's mom. There they are in the picture. She is only 21 and she was just diagnosed with Hodgkin's lymphoma this past week. We are believing for a quick recovery and if you are a praying person, we would really appreciate that too. July 15 was our 1 year blogaversary! It came and went and we've been so busy around here we just plain missed it! It has been quite a year. We've made so many awesome friends, and we lost a few, as well. On a lighter note, we'd like to share how we started blogging. If you type in "pug" in any search engine, Urban Pug is bound to pop-up. Mom started reading their blog religiously and one day she saw a link that saidcheck out these blogs and guess what! Harry Pugalicious's blog was there! So we started reading Harry's blog, and then all of his friend's blogs...and then I came to live with mom and she started my blog and then, lo and behold...our little world has expanded to include a whole lot of awesome pug (and other) friends! We truly are thankful that you guys are in our lives. And we read your blogs and smile at the good parts, laugh at the funny parts, and cry at the sad parts. You've given us support and invaluable advice, and I hope that we have given you all support when you needed it, too. 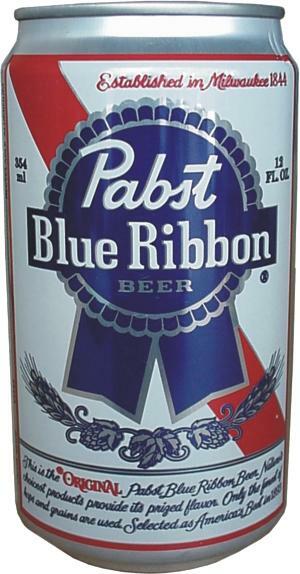 Most of all, thanks for being our friends. We love each and every one of you! Today is the day that I came to live with my mom, so to celebrate, I got to eat a hamburger for dinner! Smells like heaven! Hamburger, Get in my belly!! I love you, mom! And not just because of this cheeseburger. I'm so glad you picked me! Little baby Arlo Came to live with me! Today is his gotcha day! and I couldn't imagine life without my little guy!